Near the end of 1989, Nintendo was king of the realm of video games, and Mario was Nintendo’s favorite son. It was only natural, then, that Nintendo would use their dominance in the video game market to make inroads into television. 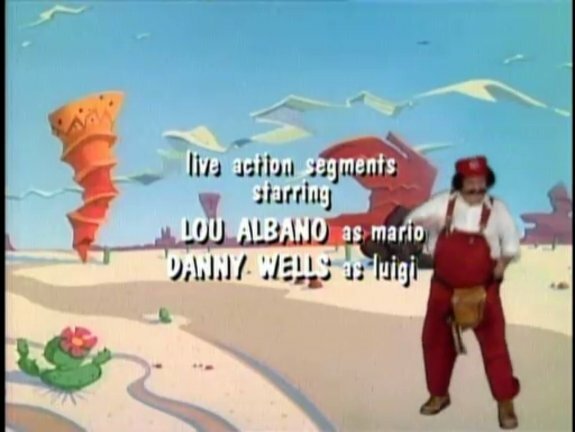 Thus, The Super Mario Bros. Super Show! was born. 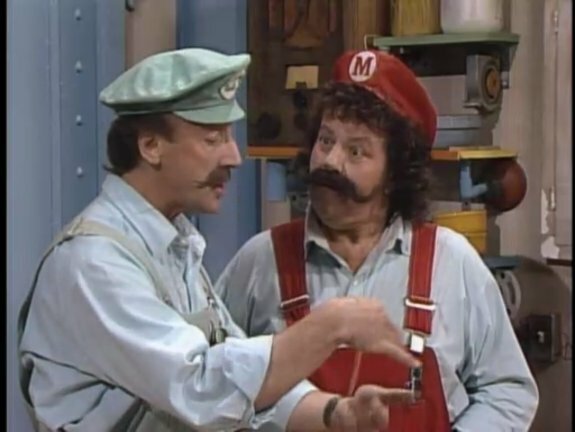 In the first episode of TSMBSS, we meet two plumbers, Mario and Luigi, played by Lou Albano and Danny Wells, who perform a brief comedy segment (“Neatness Counts”) involving Nicole Eggert, a clogged drain, and making a mess. It’s pretty awful, but no one was watching this show for the live action segments, I’ll wager. Was this how you imagined Mario and Luigi to look? After the live action segment, the animated story (“The Bird! The Bird!”) begins. Mario and Luigi, having just rescued Princess Toadstool, are travelling in a frozen wasteland, along with Toad, who is suddenly kidnapped by a nearsighted Birdo who mistakes him for her child. While the others are trying to save Toad, King Koopa receives a report on the situation (and, rather creepily, orders his minions to lick his feet). He sends his Koopa Troopas to attack while the Mario brothers are distracted, but they deflect the attack. 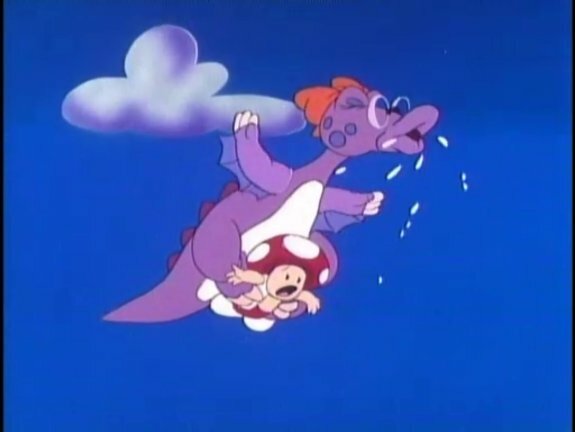 Ultimately, Koopa leads the attack himself, but with the help of the Birdo, whose child they have restored to her, they succeed in repelling Koopa and his minions. 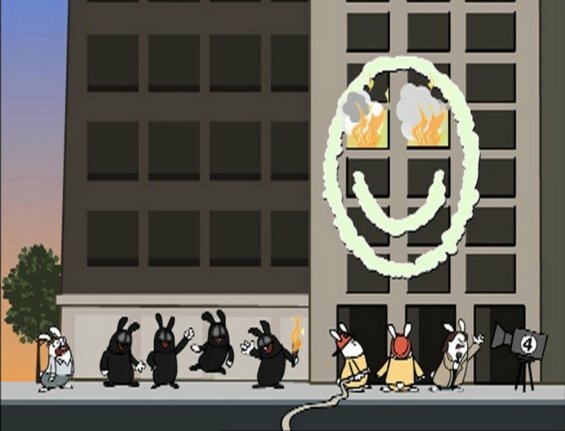 After the animated segment ends, another live action segment plays, continuing the story from the first segment. After a brief interruption for a preview of the next episode of The Legend of Zelda, the live action segment concludes–though the Mario Brothers have made a horrible mess of Nicole Eggert’s outfit, it’s fine, because she was going to a ‘sloppy party’ and they’ve saved her the trouble of buying an outfit. Yeah, right. Well, that’s the plot. As the screenshots reveal, the video quality (on Netflix) is pretty poor–it looks like a bad VHS transfer, really. What the screenshots don’t show is that the audio is also problematic, though not because it’s unclear. Rather, the background music and sound effects are so loud that it can be quite difficult to understand the dialogue, sometimes. 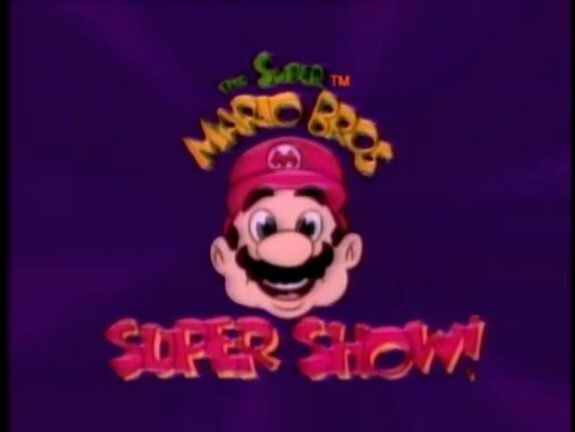 I assume that they figured that the big draw for the show was that it was based on the video games, so they wanted to emphasize that connection, by using music from the games, and inappropriate sound effects all over the place. 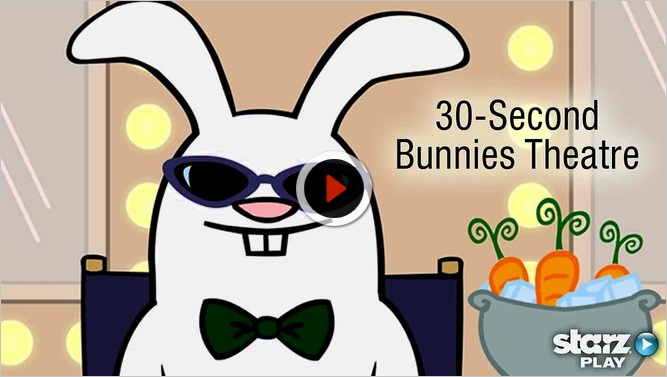 The live action segment is just bad comedy, and the animated segment is a fairly average cartoon. I’m not an eight year old, to squeal with joy over seeing video game characters on television, but it is still kind of fun. I’d say that if you’re a fan of the Mario games, and you’d like to see something a bit different, it’s worth checking this out, but it’s hardly the kind of thing you’ll want to watch over and over.